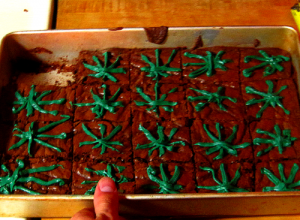 Home » Marijuana » Life in Jail for Pot Brownies!?! That’s how we do it in Texas! Life in Jail for Pot Brownies!?! That’s how we do it in Texas! When I first read this story I was a little taken aback. Some poor kid was looking at a possible 5 – 99 years sentence in jail for some chocolaty marijuana edibles?…then I read a little deeper into it and I understood why. Jacob Lavoro, a Roundrock Teenager does not just stand accused of baking any old space-cakes, he is accused of whipping up and selling brownies with a punch! The punch being that instead of just lacing the brownies with marijuana, he is allegedly put hash oil in them as well. Couple that with the fact that he is accused of cooking up quite a bakery full of his special brownies – 1.5 lbs of brownies – and we have the makings of a 1st degree felony charge in the state of Texas. The Texas legislature enacted laws against hash oil that are markedly more severe than that for marijuana. The rationale behind these stiff penalties when the laws were enacted was that hash oil is refined and concentrated, and contains almost pure THC, the psychoactive ingredient of the demon weed. Williamson County prosecutor Travis McDonald noted that the sentencing range is 5 to 99 years or life in prison, given the quantity of substances claimed to be in the brownies, but sentences can depend on aggravating factors and other considerations. So…here is the state of affairs: we have two states where recreational use of marijuana is completely legal. In Colorado and Washington anyone over the age of 21 can purchase marijuana, hash oil, pot laced brownies, or hash laced brownies for that matter. Then we have the middle of the road states (22 if you include the District of Columbia) – states where marijuana and marijuana edibles can be bought by anyone with a prescription. Prescriptions are issued for everything from severe pain to anxiety, but not exactly hard to come by in these states. Then we have places like the deep south – where we continue to fill our prisons with Marijuana offenders, and have created laws, like in this instance, which could land a teenager in jail for the rest of his life. Something is wrong here. This goes beyond just over-regulation and prohibition. Are we really comfortable with this? Do we want this kid to spend the rest of his days in a cage for making hash oil brownies?